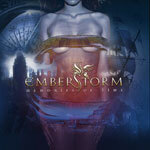 Guitar wizard Peter Stromberg began Emberstorm with a mere idea, and little direction, in 2006. With his debut release Memories of Time, Stromberg has definitely fleshed out the dream and made it a reality. With Peter Selin, a fine metal vocalist, on board Emberstorm had developed in a strong representation of melodic heavy metal. The obvious stars here, and getting the push, are Stromberg's deft guitar work and Selin's generous and versatile vocals. Yet undergirding both are some classy arrangements that both intrigue with creativity and soar with robust enthusiasm; Never Ending, Cursed for Eternity, and Horizon's Call are representative, but the whole album is blessed by these strengths. Memories of Time, if anything, is pure European (or Scandi) melodic metal; derivative, yes, but in the very best sense. Very few of Emberstorm's peers could be this articulate in composition straight out of the gate for the first time. While Stromberg's guitar work sizzles, it's also fundamental, and never overbearing. It compliments the songs as does the other parts including Stromberg's keyboard layers and even, the several, but unnecessary, death metal growls laced into some songs. Stromberg and company should be pleased with Memories of Time: it's a strong debut of entertaining melodic heavy metal that is bound to capture the interest of anyone who loves the genre. Indeed, I wonder why labels like Lion Music, Escape Music, or Frontiers have not picked up on this band. Very recommended. Stromberg and company should be pleased with Memories of Time: it's a strong debut of entertaining melodic heavy metal that is bound to capture the interest of anyone who loves the genre. Indeed, I wonder why labels like Lion Music, Escape Music, or Frontiers have not picked up on this band.